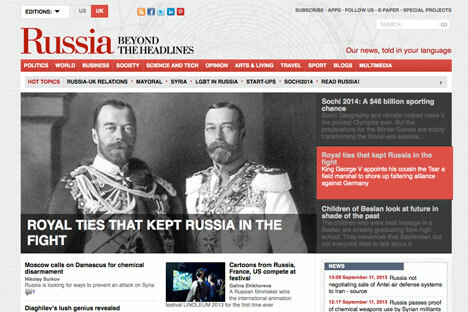 Over the past years, the English-language of website Russia Beyond the Headlines (RBTH), one of the largest international source about Russia, boasting 17 websites in 15 languages, has covered news and produced features for both its American and British audience. As our readers in Britain grew considerably in a short time and we received your comments and feedback, we decided that it was time to launch a new edition specifically tailored to the UK. Read us in September to explore the British places in Moscow, learn about the relationship between King George V and Tsar Nicolas II, view our analytical comparison between the London and Sochi Olympics and discover our special project for social media dedicated to Russian expats in London. On September 4 we created a separate web page for our UK and European audience, accessible through the URL rbth.co.uk. Our North American audience can still access RBTH at rbth.ru. We have added a geo-targeting feature, so if you are in Europe you will automatically see the UK version of the website. You can always click on the UK/US button at the top of the homepage to switch to the US edition. Content with an appeal to both our UK and US audience, originally published on rbth.ru, is being modified and rewritten for the UK website to increase its relevance for our British readers. In future we hope to provide more pieces on bilateral exchange between Russia and the UK, share with you unique stories illustrating the relationship between the two countries, publish exclusive reports, photo galleries and videos, and much more. Starting from September 11 our British readers will be able to follow us on Facebook and Twitter, discovering stories from the website alongside a whole new set of features created exclusively for social media. A more light, immediate and visual approach enriched by the presence of listicles, quizzes, jokes - all aimed at informing you while putting a smile on your face.